How the low temperatures affect the car? In the winter part of the year, appear changes relating to motor drive, as well as many factors that determine the behavior of complex systems which work on car. Cold weather and low temperatures have a huge impact on the car. A low temperatures are associated with engine performance. Accordingly, it warms slower and does not function good like when is warmed. When the motor oil is cold, engine friction is higher. When it is cold, the car increases the fuel consumption. If the temperature fall below zero degrees, there is danger of frost antifreeze, washer fluid, and some other systems. So winter is necessary to use winter supplies to prevent all these problems. Ice and snow can freeze the windows, wipers, locks and doors. Thoroughly clean everything, because when is frozen, it is very fragile. Any carelessness can harm some detail. Do not use the parking brake when parking the car. It can freeze and prevent you from when you attempt to drive off. If the the wipers are frozen and turn it on again there will be unpleasant consequences, fuse, relay or the wipers motor. Sudden temperature changes influence the battery of the car. If the it is not powerful enough and is too old, you can find your car without electricity. Tire grip with the road is much less, if is iced. If there is no ice under the snow, the traction is better than if it is iced. It is very important the tires and their tread. Winter tires are different from summer, because of the material they are made. They are softer and it grapple is specific. Unlike the summer tires they use another ratio type of rubber compound. This helps for better grip in winter conditions. But winter tires increase even not much fuel consumption of the car. The behavior of the car on the road in winter depends entirely on its preparation. If it is well equipped with winter tires and winter equipment, the chance of trouble really reduced. But is very important the role of “behind the steering device” 🙂 . 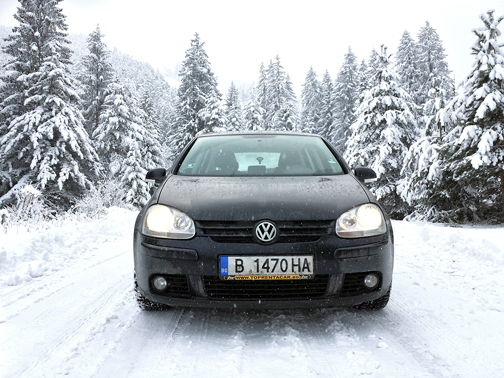 All vehicles supplied by Top Rent A Car, are fully equipped for winter conditions!